The master bedroom seems to be one of those rooms that goes unfinished until the rest of the house has been taken care of and appropriately decorated. We have the basics in our bedroom right now – a platform bed frame that Keegan built, nightstands (that he also built), a large dresser with a mirror, lighting and sheer draperies. I have a little list of tweaks I want to make to this room, and I think I’m going to start with adding a headboard. I don’t know what I like more about this room – the wallpaper or the bed. This room feels very elegant and traditional with the dark wood tones and symmetrical nightstands, but it still appears welcoming and cozy. I think the shape and color of this headboard is interesting, though I don’t care for the two little pieces that look like lamb’s ears. In this room, I like how the neutral headboard pops off the dark walls. A similar style would work well in our bedroom, which is painted Sherwin Williams Quiver Tan, a warm gray brown with green undertones. This headboard is incredibly feminine with it’s elegant cuves, embellished with cording, and delicate pattern. 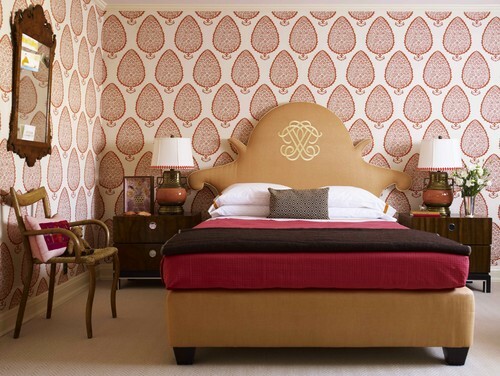 The headboard interrupts the fabulous graphic floral wallpaper in a good way. 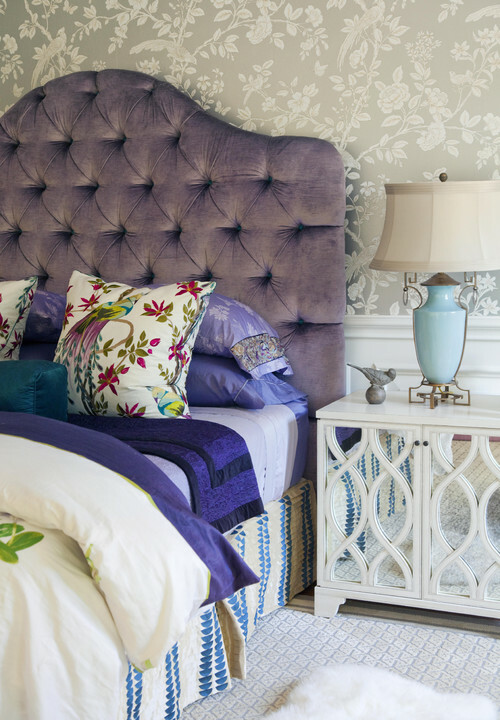 A generously tufted arched headboard in a dusty violet velvet is very dramatic and would be too formal for our house, but I appreciate the daring palette the designer applied in this room. 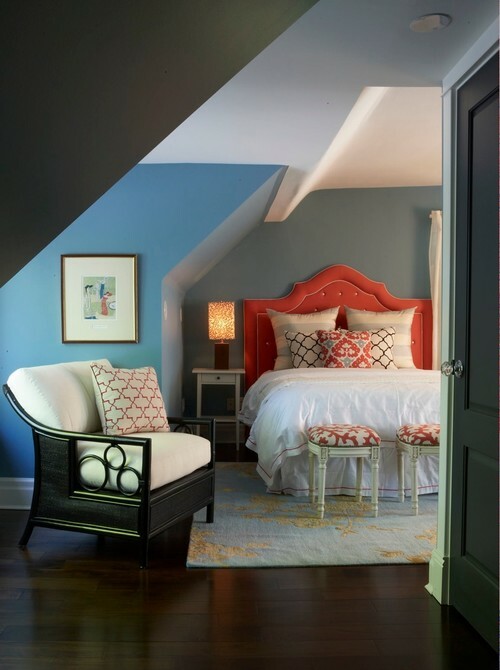 Here the designer uses the headboard as an opportunity to introduce color. I like how the rest of the elements in the room are fairly restrained and that the red from the headboard is repeated in the patterned fabrics on the benches and the the throw pillows. This room feels both sophisticated and comfortable. 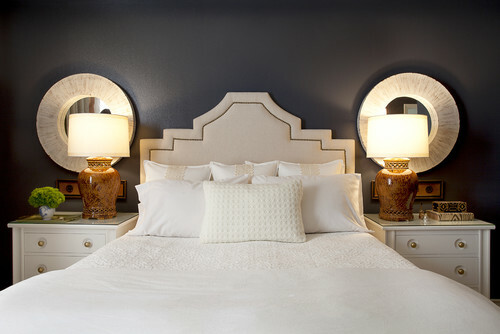 What do you think about upholstered headboards? Do you prefer arched or straight across? Patterned or solid? Tufted or flat? Embellished or plain? There are so many endless combinations and so many opportunities to create a completely custom look. You can view more upholstered head board ideas and the rest of my IdeaBook on Houzz.